I'm such a slacker! But I'm catching up! Would you believe me if I said I've been too busy praying to write about it?? No? This is a catch up post for day 14 and it is about Jesus, and what we can learn about prayer from him. Jesus prayed a lot in the gospels. It's interesting to think about, since he was God and all. I've heard it asked "so was he just talking to himself?" The theological reasons behind why Jesus spent time in prayer aren't really my point here, but one very important practical reason is definitely the place to start this post. Jesus prayed to lead by example. He prayed so that his disciples and followers would see him praying, see the importance of praying, and follow his lead. 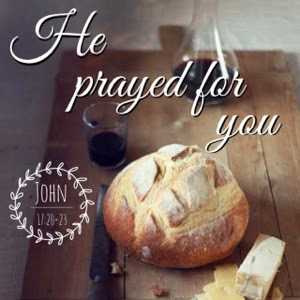 One of my favorite examples of Jesus prayer is in John, during the time Jesus spent with his disciples washing their feet and eating with them. They had sat down for a meal, Jesus had washed their feet and was doing what I think a lot of us would do if we knew we were going to be gone soon, he spoke to them, shared his heart with them, gave them wisdom and encouragement, and he prayed over them. The entirety of chapter 17 is a prayer Christ prays over the disciples. It is a powerful intercessory prayer, a prayer of blessing, and one that tells us so much about how to pray for others. If you haven't ever read it go check it out. I know in church we talk a lot about the Lord's Prayer as an example of prayer, and I do love that! But man, imagine if we prayed for one another hitting all these same points? What if I prayed for you, every day, that you would live in a way that glorified the Lord, that you would know and live in the joy of the Lord, that you're heart would be protected from any attempts made on it by the enemy, that you would be sanctified and holy, and that the love of God would be in you and exude from you for His glory. Guys that is a powerful prayer. I challenge you to choose a person and pray that prayer over them every single day for a week. See what it does in their life, see what it does in your life! Since starting this series I've had so many people (I honestly didn't realize so many of you were reading) ask how to start when it comes to praying, "what do I do?" I keep being asked. Start here. Start with this prayer that Christ prayed over his disciples. This prayer that is worded in love and authority, the same authority that we have been given, start here. Pick a person to pray it over, commit to doing it every day, and start here. Before I end this post I want to share with you my favorite part of this chapter. It's pretty big, are you ready? It blows my mind to know that Christ prayed for me. To know that he prayed for an indwelling of his presence and power in my life so that my life would point to God the way his did. That he included me in his prayer for protection and holiness and joy. Jesus prayed that you would experience the joy of God that he himself had!! If that doesn't blow your mind, man nothing will.